We had our first women’s mtb ride of the year on Tuesday and had a lot of fun. The Pine Beetle has really damaged one of my favorite ride spots though- Dufferin. Many of the dead tress fell from the high winds we had this winter and others were cut for safety reasons, but they are currently lying all over the trails so we had to do a bit of tree skirting. Training got derailed a bit this week as I got a 24 hr bug –sore muscles all over, fevery chills and sweats and an uncomfortable stomach…which has hung on until easter and makes the thought of chocolate a little less fun, but not out of the question. Worked Wednesday to friday although Thursday I was pretty useless with my bug. Friday after work I got in a recovery spin with Keith in our sunny 25 degrees before heading to Revelstoke for the long weekend. In Revelstoke we’ve had great weather too. 18 degrees both days. Even though there are huge snowbanks in town still Mt Cartier was clear for riding. It has to be the most brutal early season ride though with really steep long climbs. We went up twice to spend more time on the mtb. Sunday we headed out on our new road bikes. It’s such an amazing thing to to be riding in shorts, but surrounded by white capped mountains and snow lined ditches. Check out this Pic from Brendan's new shop. He found a wicked building with all natural wood finishing. 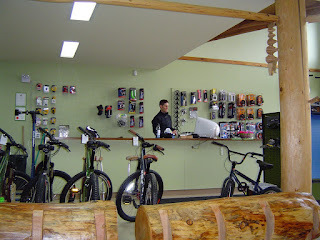 Huge logs hold bikes for display and there's a coffee machine and couch for the weary who find themselves always in bike shops. His inventory was just arriving as we landed in town, but the place is already looking great. When in Revelstoke definitely stop by 709 Victoria Rd to check out Flowt. We’re stopping in Salmon arm on the way home tomorrow to meet up with some friends and ride the Salty Dog course before making our way back to Kamloops. Then it’s back to work and another women’s mtb ride.